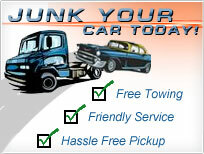 Junking Your Car only takes a few minutes with the following online vehicle submission form! Fill out the form below and representative will call you to arrange a pickup of your vehicle. Copyright 2008 © Jack's Used Auto Parts. All rights reserved.